Today's featured shop on Lollishops is Darkling Woods. The shop features to artwork of the very talented Cat Mallard. The piece entitled Magic Carpet Ride really caught my eye, as this 8 by 10 print would look fabulous in a vintage frame in a children's room. I'd hang this one on the wall in Nick and Ben's reading corner. Other pieces can be found in this lovely shop. 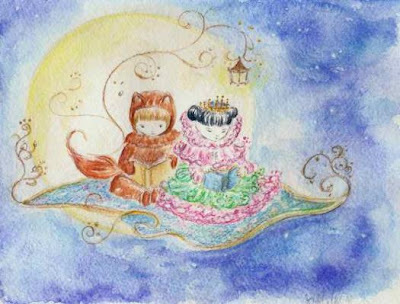 I plan to keep checking this shop for new items, because her watercolor work is just beautiful. Check out Cat's boutique today and don't forget to tell her Chic & Green sent you!